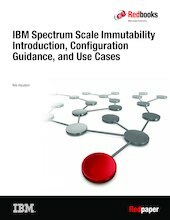 This IBM Redpaper™ publication introduces the IBM Spectrum Scale immutability function. It shows how to set it up and presents different ways for managing immutable and append-only files. This publication also provides guidance for implementing IT security aspects in an IBM Spectrum Scale cluster by addressing regulatory requirements. It also describes two typical use cases for managing immutable files. One use case involves applications that manage file immutability; the other use case presents a solution to automatically set files to immutable within a IBM Spectrum Scale immutable fileset.